On a recent Wednesday evening we made our way to Lingenhel. When I made the reservation I had requested a table far away from the automated door which had annoyed me so much last time. No trouble this time, the place was rather empty and we got a really nice table. Right away one change was noticeable to my last visit. There were a lot less vegetarian dishes available. Funny in a way because this is also a cheese dairy. Three of us went with the three course evening menu while the fourth person ordered a Schnitzel. 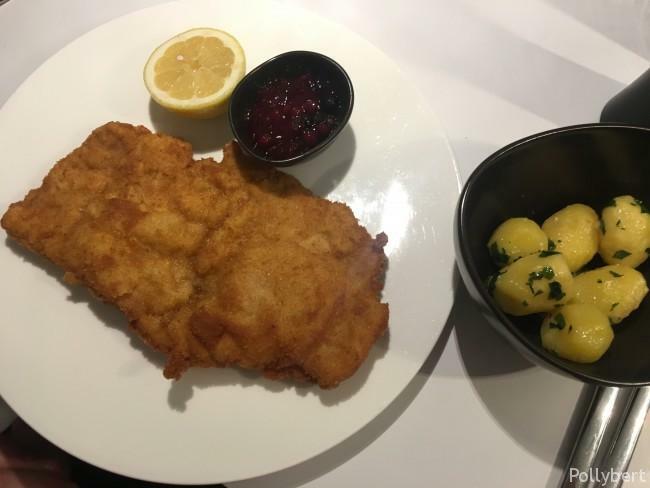 Since Schnitzel is a staple in Viennese food, it’s usually always good. Here it was as well. 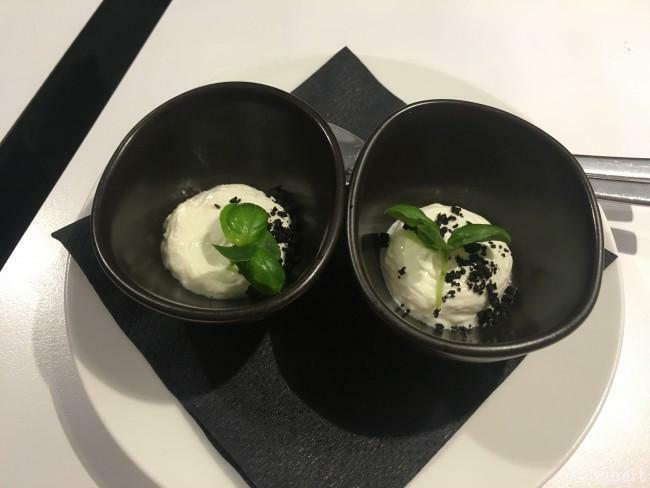 All of us started with an amuse guele which was a ricotta cream with parmesan and dried black olives. It tasted of more and wet my appetite. The evening menu had one starter, two main dishes for choice, one cheese and one dessert course. 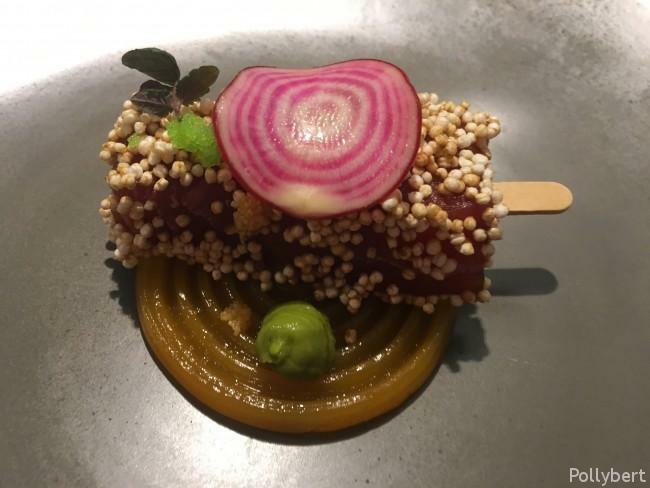 So the starter was a tuna ‘lollipop’ with popped and cracked quinoa on passionfruit, avocado, wasabi and carp caviar. It looked special when it arrived and the lollipop theme worked well. Unfortunately my piece of tuna was not sashimi quality and had a bit of sinew. The others were better off. Nonetheless there was too much passionfruit for the tuna. The slice of the red chioggia beet on top cut the sweetness well. The idea was there, the execution needs just a bit more finesse. The two main courses were fish or meat. 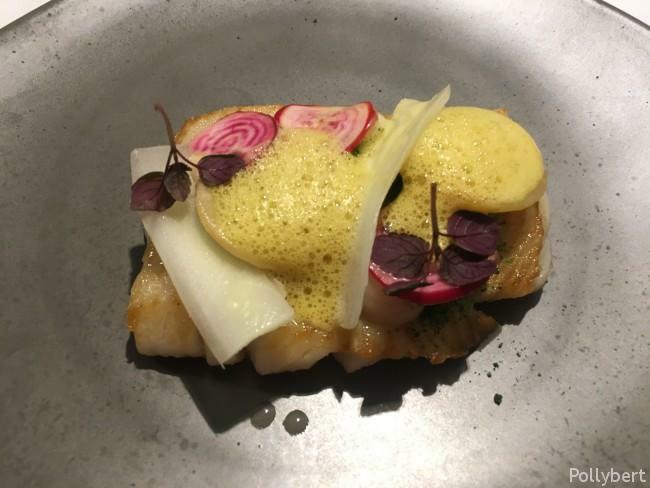 I started with the fish which was black halibut. It came with celery, parsley, almonds and curry. The curry came in form of a foam and the almonds I must have missed. The celery stalk was easily detectable and the parsley hidden beneath the foam. It came again with the red chioggia beet and here I found it was a bit too much. The beet has a rather strong taste and doesn#t work with everything. Because the fish was very subtle in its taste and I found the beet overpowering. Overall a lovely combination though. 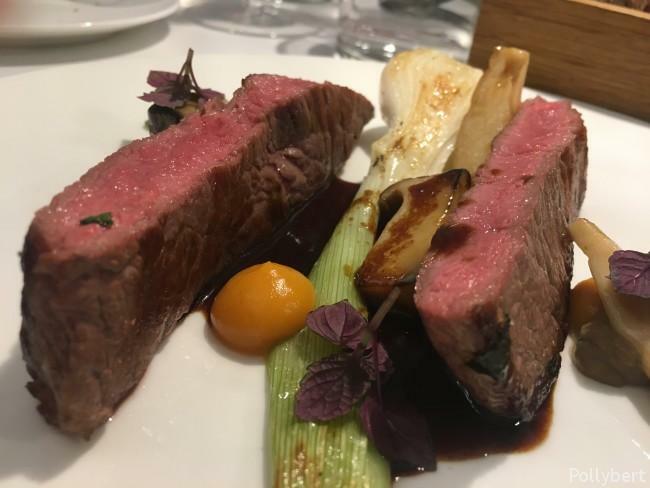 The rump steak was grilled to perfection and came with spring onions, sweet potato and king oyster mushrooms. The dish was stronger seasoned than the fish which I preferred. A really good steak. 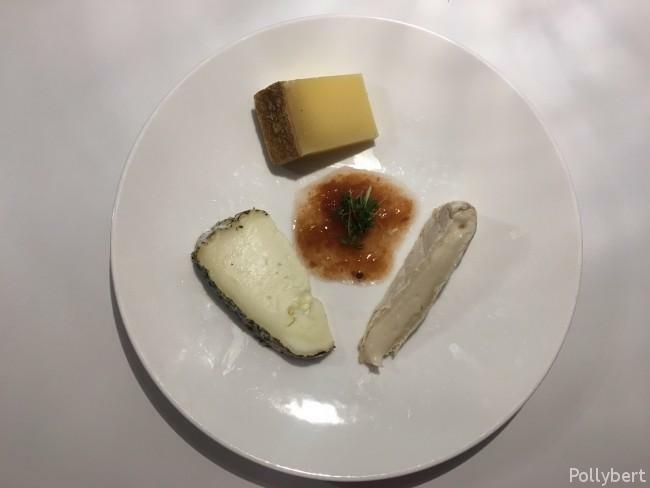 The cheese course were three different cheeses, goat, sheep and cow with peach chutney. It was served without bread, fortunately there was a bit left from the amuse guele. Interesting combination with the goat being very strong. The others liked them very much. I of course went with the sweet course, which was called Toffifee like the candy. I know the kitchen meant well but the dessert was way too big and sweet (this is not a phrase I use often). 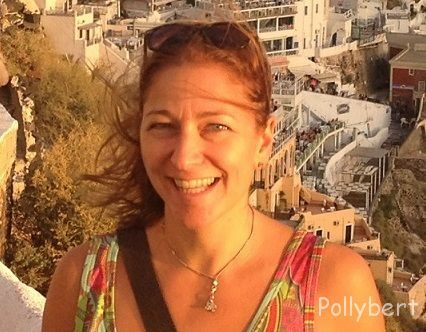 How one person alone should be able to manage that I don’t know. The combination of nougat, caramel, hazelnut and chocolate was wonderful though. At first and then it just became too much. Our second dessert was a panna cotta with grape, raisins and muesli. 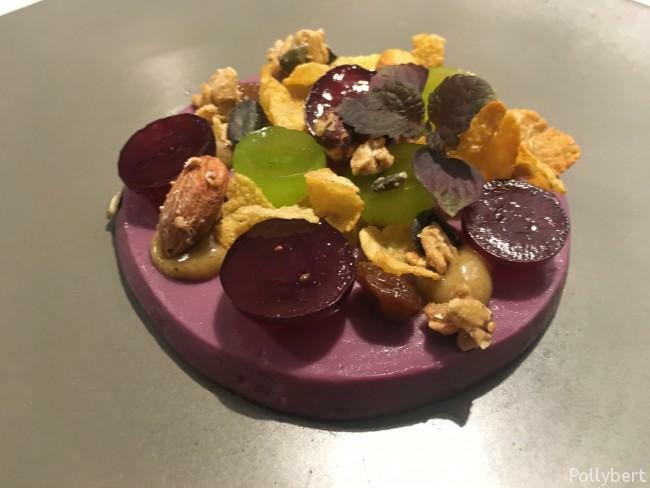 The grape was actually in the panna cotta which gave it a lovely purple color. It was sweet as well but tasted fresher and less intense than the Toffifee. This was a dessert to finish by oneself. 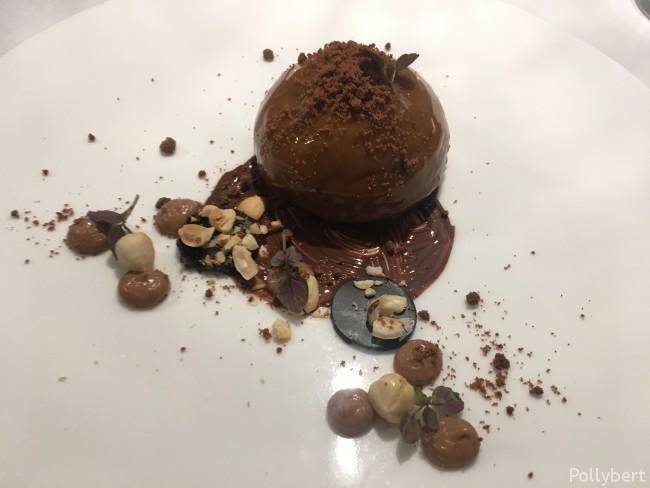 Even if you don’t order dessert there is something sweet for everyone. The kitchen surprises with another sample. 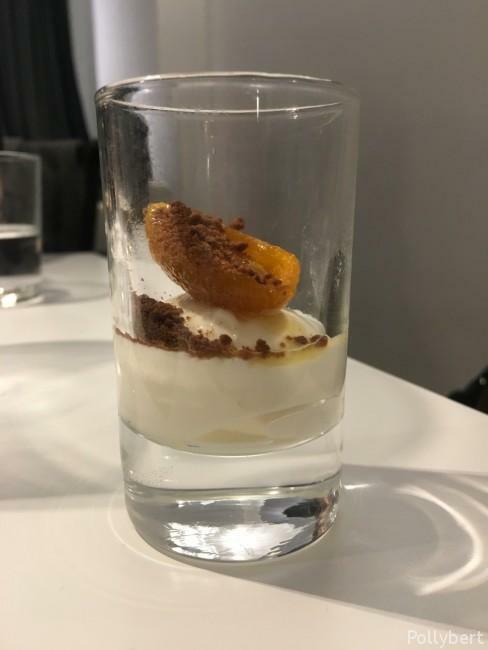 This time it’s a sweet cheese curd cream with kumquat and chocolate. Just perfect to close the meal. 3. 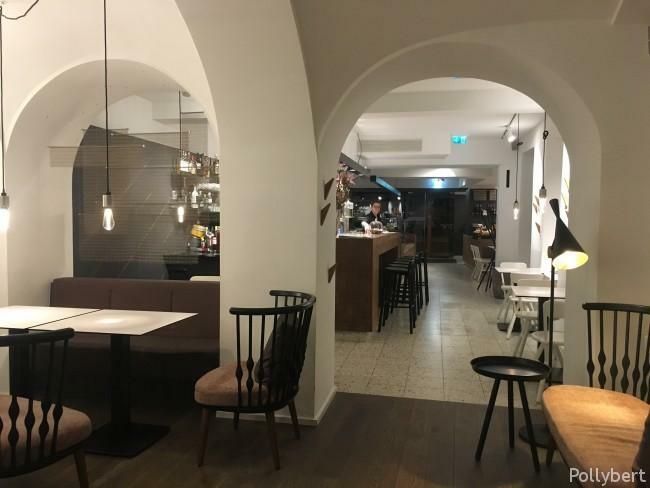 Bezirk, Austrian food, dining in Austria, dining out with friends, local food, restaurant review, Vienna, Wien. Bookmark.